Walk to help save lives. It takes ladyballs to learn about ovarian cancer. Here’s what you need to know and why everyone should care about this disease. Attend a fashionable evening in support of Ovarian Cancer Canada. Purchase your ticket now for THE LADY BALL Calgary on May 23 and THE LADY BALL Charlottetown on May 30. Thank you to everyone who supported LOVE HER in Vancouver on April 4. 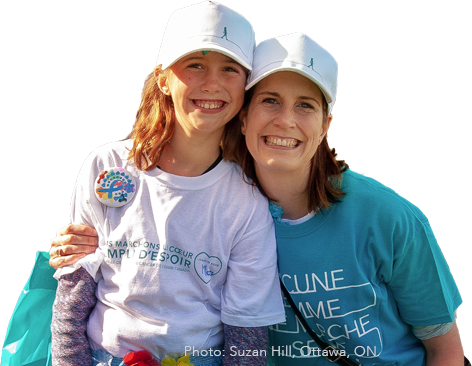 Volunteers inspire and enable the work of Ovarian Cancer Canada. They rally communities far and wide, put the spotlight on this important women’s health issue, and give a voice to those affected by the disease. If you or someone you know volunteers to support the mission of Ovarian Cancer Canada, celebrate these important contributions by sending in a nomination for the Peggy Truscott Award of Hope. Featured Story: Donna You are stronger than you think you are. Being an ovarian cancer thriver was going to be my reality. At that age I was thinking of having children. To find new treatments, we need the clinical trials out there. 2,800 Canadian women are diagnosed with ovarian cancer every year. 2.1% of donations for cancer are directed toward ovarian cancer. $6M to date has been allocated to research by Ovarian Cancer Canada. 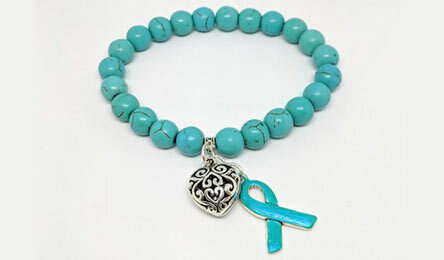 The Teal Shop is where you can buy items that support Ovarian Cancer Canada. Proceeds from each sale are put hard to work helping women live fuller, better, longer lives.